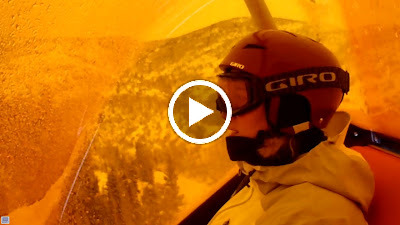 In a recent run to Park City, the wife and I just had to try The Canyons Resort’s “Orange Bubble Express,” a heated, aptly-named domed chair lift that is considered one of the highlights of a massive investment made in the facility during the off-season. We had what could be considered a perfect day for such a mode of mountain ascent but I still couldn’t help but feel a tad uncomfortable about being enclosed within a space as small as a chair lift. I have no fear of heights. And I love the exposure to the elements that a chair lift affords. You can scope runs, spot signs of wildlife and just take in the views. The Orange Bubble Express, for me, takes all of that away. Sure, I could have simply lifted the lid but then, its purpose of design is rendered meaningless. I admit the heated seats were a nice touch, especially given the frozen swamp that hung in the sky that day. However, I think there’s a reason we don’t see more enclosed chair lifts. The Canyons remains my favorite of the Park City resorts. It’s size allows you to escape even holiday weekend crowds and the terrain provides extensive variety.